When Snow arrived at Southern Pines, she made her presence known. She was a giant, teenage dog who was frustrated and destructive. She dug holes, chewed up bowls, destroyed crates, jumped, and barked. She desperately needed for someone to notice that she was bored, nervous, and lonely, but instead she was overlooked time and again… until the day she met Lacey. Their connection was instant and undeniable. Lacey lives with both epilepsy, a disorder that causes recurrent seizures, and Tourette’s syndrome, a condition that causes repetitive, involuntary movements. She and her doctors began a long journey of trying to manage these disorders through various medications. While the medications helped, they left Lacey not always feeling like herself. While most young adults her age were planning to attend college, move away from home, and drive on their own, Lacey and her family didn’t know if Lacey would ever be able to do the things she’d always dreamed of. Determined to live life on her own terms, Lacey approached her doctor looking for other options. 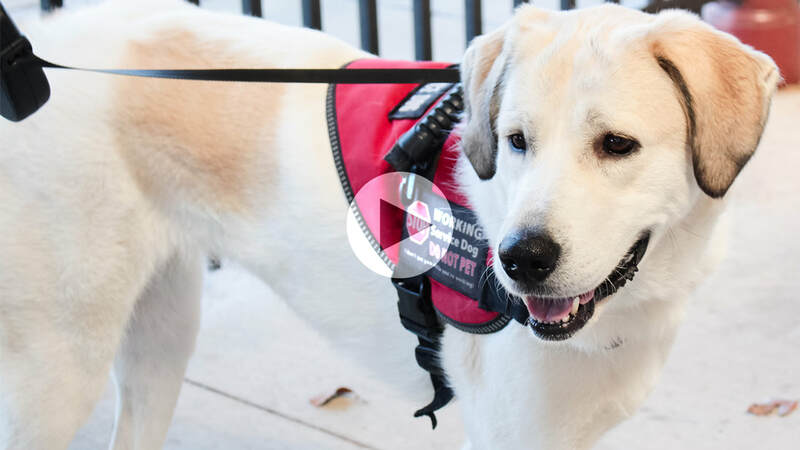 When Lacey’s doctors recommended that she consider a service dog, Lacey found her way to Southern Pines and Snow. Today, Snow is a constant in Lacey’s life. She is a registered service dog who alerts Lacey when it is time to take her medicine. She supports Lacey when her legs are weak. She calms Lacey and keeps her safe. Snow has been with Lacey every step of the way – on graduation day, when she moved into her own apartment, on her first day at her brand new job, and on Lacey’s wedding day. Snow’s & Lacey’s story is the kind of ‘happily ever after’ you create every time you make a gift to Southern Pines Animal Shelter. Stay tuned to hear more of Snow & Lacey's story! Your generous donations make all the difference for homeless pets in need. Each year, Southern Pines cares for more than 6,300 dogs and cats looking for their second chances, and donations like yours help to provide food, medicine, shelter, and care to each of these pets. Because of your support, we have reached no-kill status while continuing to accept pets in need from across the state of Mississippi.